Brown Rice and Red Kidney Beans with Aubergine and Bell Peppers in Coconut Jerk-Style Sauce. Fabulous served with a spicy grilled chicken breast or pork chop, and finished with a dollop of yogurt, chopped fresh green chilli and lime wedges. Heat up in 1 minute. Big on flavour! Wholegrain rice with fiery chilli, aubergine & beans. Seriously good with chicken wings. Source of fibre. Ready to eat in just 1 minute. Suitable for vegetarians. 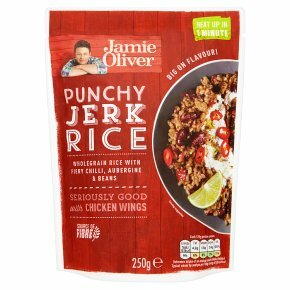 We've mixed garlic, ginger and jalapeños to create a jerk marinade with attitude, and added this awesome spice mix to coconut-infused wholegrain rice, aubergine and kidney beans for a knockout combo! Made with love, Jamie O What's so good about...? Wholegrain rice is the ultimate rice for a healthy lifestyle. With its bran layer intact, this rice is rich in nutrients and natural fibre and has a deliciously distinctive nutty flavour. It is perfect paired with bold, spicy flavours. Hints & Tips Fabulous served with a spicy grilled chicken breast or pork chop, and finished with a dollop of yoghurt, chopped fresh green chilli and lime wedges. To heat up, squeeze the pouch to separate the rice and beans.Tear the top corner open by 2cm, heat for 1 min in a 750W/Cat D microwave, open and watch out for the steam. Job done!